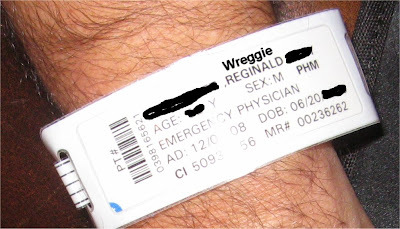 Wreggie, only YOU could damn near cut your thumb off, take yourself to the hospital, ENJOY watching the procedure, and still get yourself home in time for guests. And... did I read that right? You called it "a day off?" Ahh...The old jumping hole cutter story, glad it was just sticthes. Easy for me to say huh? Now, about the beer spilt, that is totally uncalled for and you should be ashamed for the waste from the haste. I can't help but chuckle picturing the dogs! Luca is all gimpy today, I was kicking a ball around and she sprained her hind leg. Of course she never slowed a beat while we were playing, it was only after in for the night that she started limping. Yes....it was an adventure Terri. I'mm all about adventure. Micky I know this broke a man law that all beer should be secured before rushing off to the hospital. That is why I stopped to save what was left. OMG the foam...the broken glass! It made me queasy at the loss of so much innocent beer. I don't want to relive that moment any more. Why no pics of the horribly disfigured thumb?? Good job going back and cleaning up the mess, but be more careful with the beer next time. I don't know what upsets me more.....your mangled thumb, or the thought of those poor beer bottles scattering theirs guts all over the road. Damn Wreggie..... exactly how many bottles got wasted? Must I continue to relive this pain?